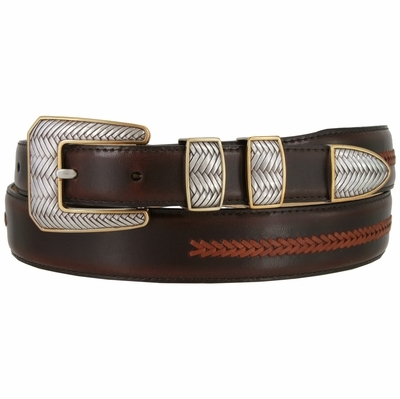 8204 Genuine Italian Smooth Woven Leather Belt with Silver and Gold Crossweaved Buckle Set. Tapered from 1-1/4" to 1" wide Italian Leather with a Tan Leather Hand Laced Woven Pattern. Stitched Antiqued Silver and Gold Plated Crossweaved Buckle, Keepers and Tip.